Very short day today and a short post. Only 210 miles. 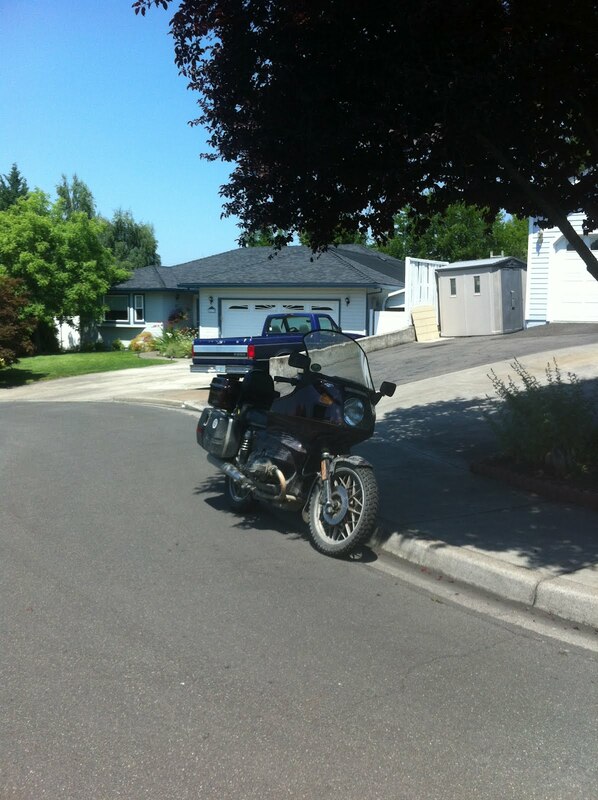 Corvallis, OR, to Medford, OR. The plan was to get an early start to beat the heat and I managed to leave by 8:00am. It was foggy and turned out to be pretty chilly and by Eugene, I had to stop and dig out my jacket liner. By Roseburg, the fog had burned off and it must have jumped at least 20°F and by the time I reached Medford, it was in the 90's. I have known this couple almost 30 years from when we were all still students at the University of Alaska Fairbanks. Great travels. Love how the bike is hugging the shade. Shade is a valuable commodity as it is hot sitting in the sun. All I know is the last time we were in Medford it was over 100°F and we were sweltering. We had glass T-tops on our 'Vette and the A/C wasn't working right. It is only 99°F today so it's pretty pleasant. Temps are always warm further south on I-5. Roseburg especially. Glad the fog lifted for you. Chilly mornings and hot afternoons, welcome to Oregon. Everytime I've been in Medford it's been pretty hot so I wasn't surprised. What did surprise me was the cool morning temperatures and the need to dig out the Gerbings (no heat neede). My mesh jacket has an zip-in nylon liner and that has usually been sufficient. Enjoy the easy life Richard. After days of building saddle callouses it's just as nice as sandy beaches and girls in bikinis. Actually, now that you're in the heat you're probably wishing for some waterfront real estate. I'd make Alaska vs mainland jokes, but you're suffering too much to endure my crappy sense of humor on top of everything else I'm sure. I am enjoying these slack days. I wa trying to build up a buffer earlier in the trip to either allow for the unexpected. Nothing unexpected came up so it's nice to have the days off. I wonder why Blogger thinks you are a spammer? So was the ride fun? Did you enjoy the views, the sensation of freedom, of being on the road, no phone, no responsibilities. Did you bond further with your bike? Do you look forward to back roads to Santa Cruz and a pistachio ice cream at Marianne's? I wouldn't put interstate 5 riding in the fun category but it sure beats looking at a computer screen. I have had several things come up that I needed to address in Barrow and the iPad has proven itself to be up to the task. Yes, I do look forward to Santa Cruz but one more boring day of I5 tomorrow. Here's an Alaska thread you may have missed. How not to ride Up North. A tale of astonishing naïveté that a light packing traveler like me finds foolhardy. For you to peruse at home. That's a crazy thread. Words other than foolhardy come to mind! Medford, it was one of my favorite ports of call on my trip last year. It was my first Motel 6 experience and a spot where I met some greaet people passing through. I've great memories from there - and the weather was absolutely perfect - no heat wave last year. HEre's hoping for good weather en route to Baker City. For me, it has been a favorite stop so I can visit longtime friends.